Our jaded readers think that 35 grand is too much for a 500 horsepower BMW, so now we have no choice but to break out the heavy Nice Price Or Crack Pipe artillery: Ferrari! Nice Price Or Crack Pipe: Supercharged, 500-Horsepower BMW 540i For $35,000? OK, so it's a Mondial, the only kind of Ferrari I've managed to find down on the Alameda street. Many self-described Ferrari purists sneer at the Mondial, for reasons that would probably require a platoon of Italian psychiatrists to explain, but it's possible to tune out the anti-Mondial propaganda when you check out the odo on this one: 5,944 miles! Is $37,995 worthy of Nice Price honors? 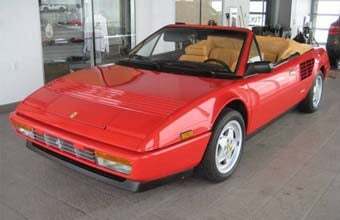 $37995 for a low-mile Ferrari Mondial?